We are thrilled to welcome Billy Mitchell as one of our featured guest speakers for the 2014 Southern-Fried Gameroom Expo! Mr. Mitchell is well known among geeks and non-geeks alike. Having achieved success in the early 80’s by setting records on video games, Billy was featured in Life Magazine and even toured the country as member of the U.S. National Video Game Team. Setting himself apart as a fierce competitor, Billy was named “Video Game Player of the Century” at the 1999 Tokyo game show and received a special award presented by Namco founder Masaya Nakamura for the first-ever “perfect” game of Pac-Man. Mr. Mitchell has also starred in the films Chasing Ghosts: Beyond the Arcade and King of Kong: A Fistful of Quarters. 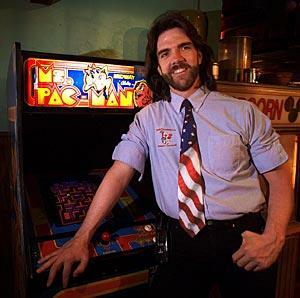 To this day, Billy Mitchell continues to score world records and promote gaming for a new generation.